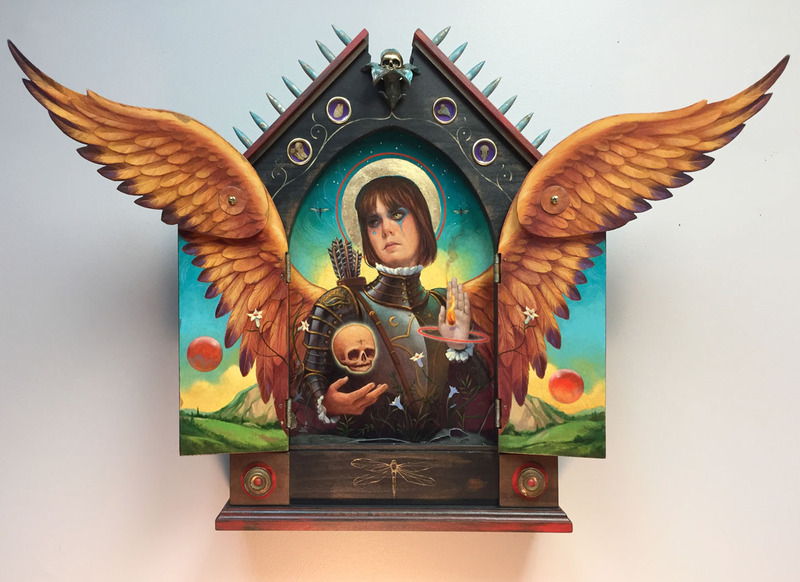 “Reliquary of a Warrior Angel” approximately 18.5x26x6” (wings extended). Mixed media. 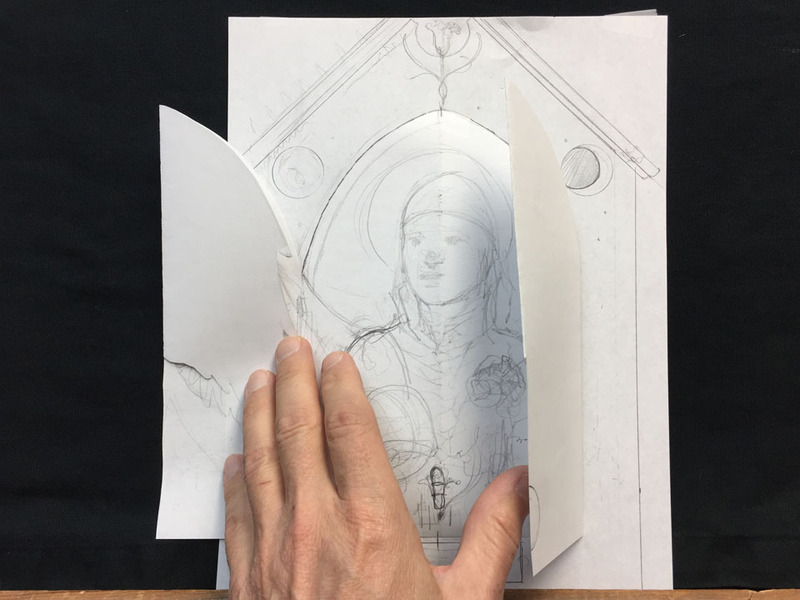 I thought it might be nice to do a post about some of the steps involved in creating my newest reliquary piece. I have to say it took much more time than I anticipated to go from drawing to final art not counting the year or so the concept rattled around in my brain. 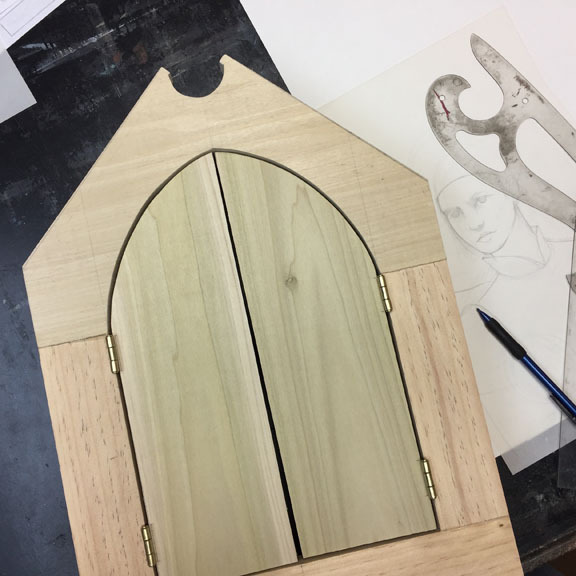 Months ago I even asked a friend of mine who is an accomplished woodworker if he could build the casework for me, before I began work on another project and set the idea aside. 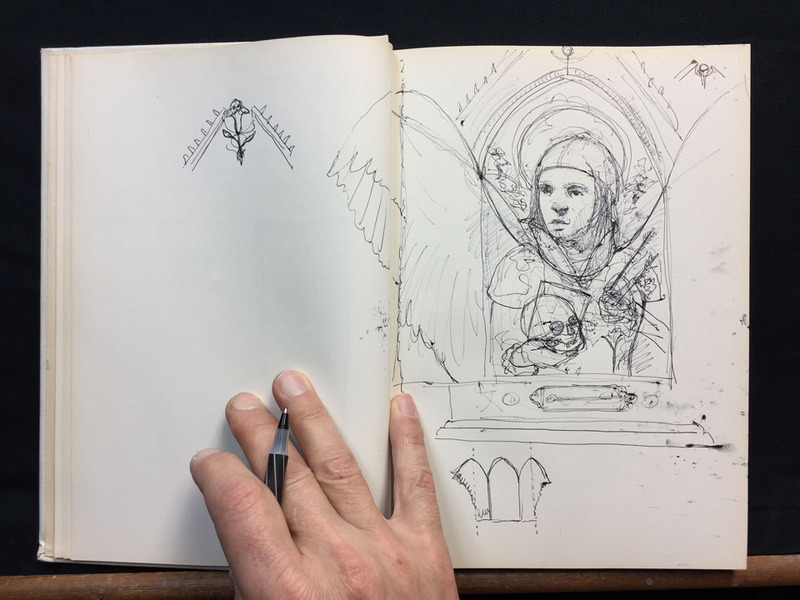 But a couple of months ago I revisited the concept and began sketching, considering things like what type of figure I would portray and how the doors would open into wings. That’s when I decided to call my own number and get to work. 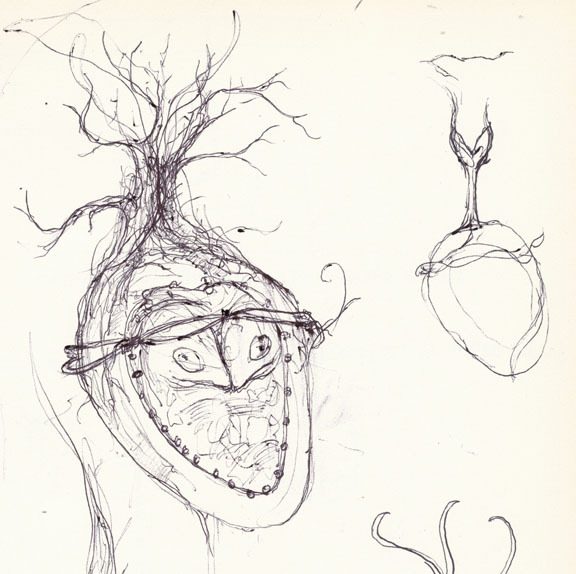 This is my original sketchbook drawing. 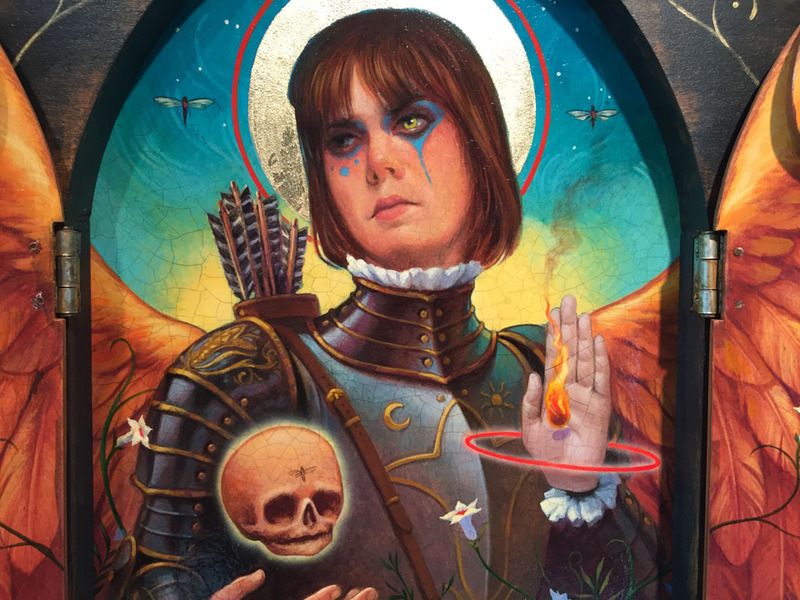 I had settled on painting an angel, in this case an angel as warrior. 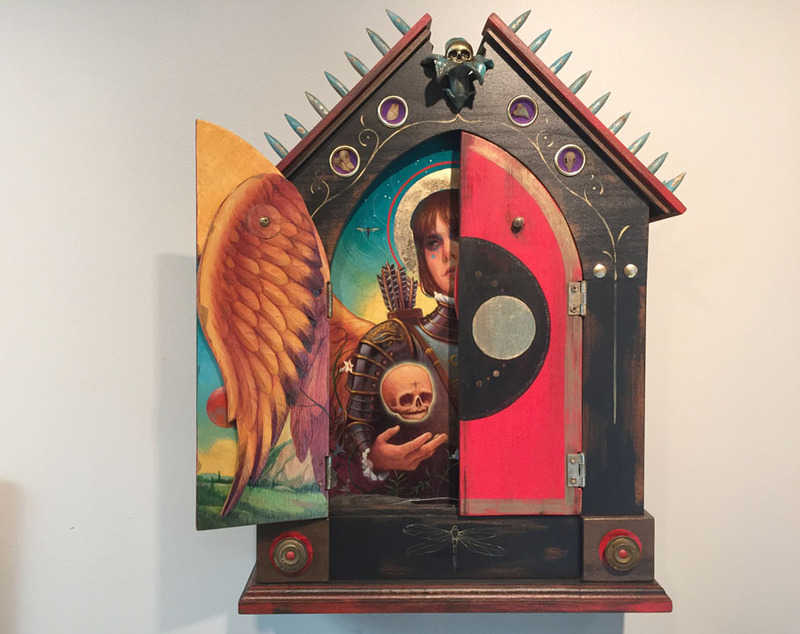 The angel would have some mystical elements that picked up and expanded the ones featured in my Dankquart Collection series and of course the doors would open up and be painted as wings. 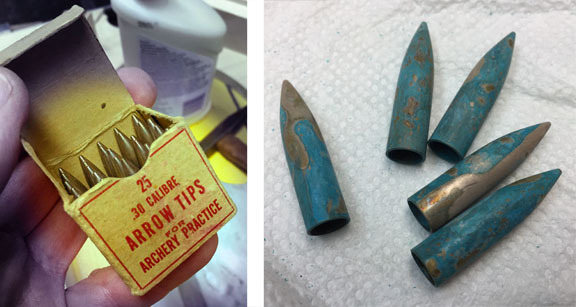 Making the subject angel a warrior meant I could work in a box of vintage arrow tips that I had stored away waiting for the right project and I’ve indicated them in the drawing. I also included a skull flower ornament at the top of the piece which has become an icon in the imagined culture that these piece originate from, (the same iconic sculpt as the pendants that were available as this month’s Featured piece). Once I had the drawing, and a firm idea of how the entire piece would work, I created a paper mockup. Originally I planned to have the doors open out, and then open out again, as they are mocked up here. That created an interesting situation with hinges that I didn’t care for when I got into the actual production, and so would later change to the swing up version used on the final. 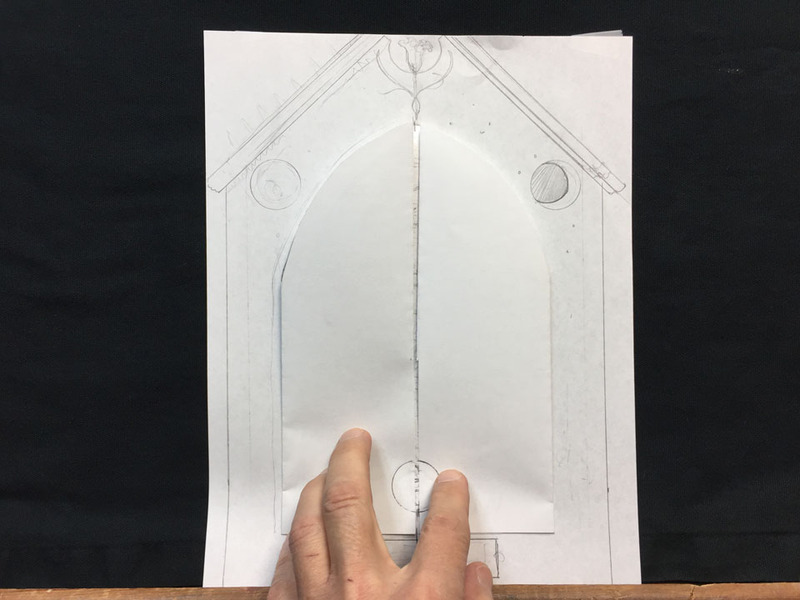 The doors would need to be solid to cover the interior artwork but the outside wing pieces could be shaped as indicated in my model. They also needed to fit in such a way that they did not come in contact with the painting inside once the doors were closed. I then went from the mock up paper stage to a full size drawing, and from that made some templates. These would be used to cut the pieces out and make sure that they all worked together properly. You can see I’ve switched to the swing up wings at this point. The surround/box design with the first set of doors in place, and trim yet to be added. 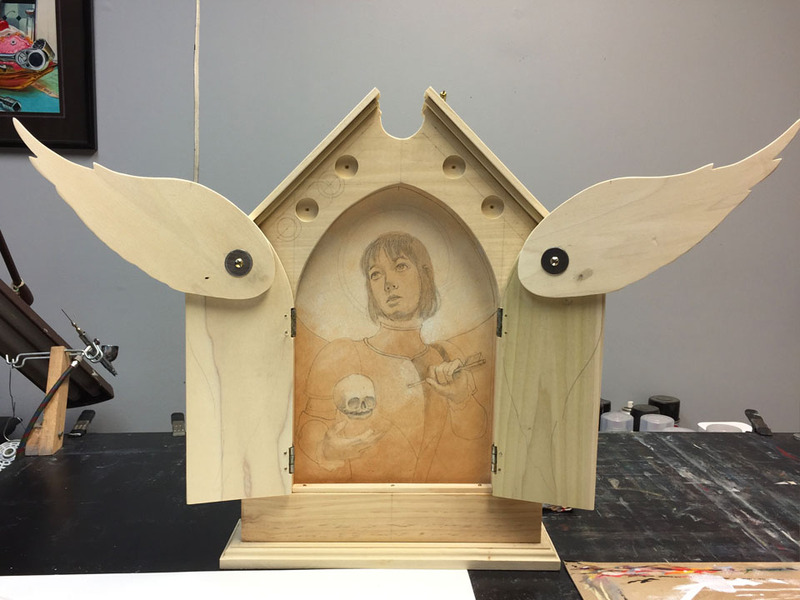 Here the casework construction is nearly complete and I’m testing the fit of the artwork to make sure the wings visually run in one continuous sweep from the central painting across the two open doors. 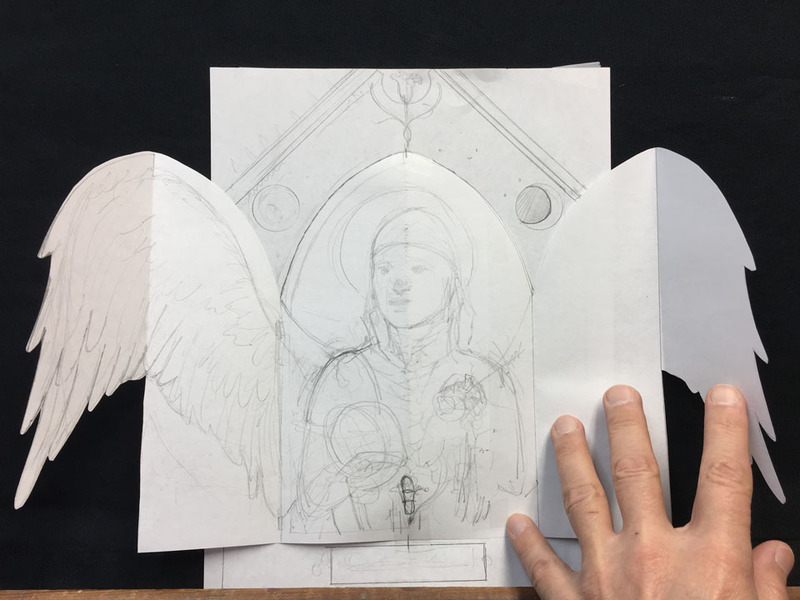 I wasn’t happy with the original design of the angel artwork and changed it as I went farther along with the rendering as you can see below. 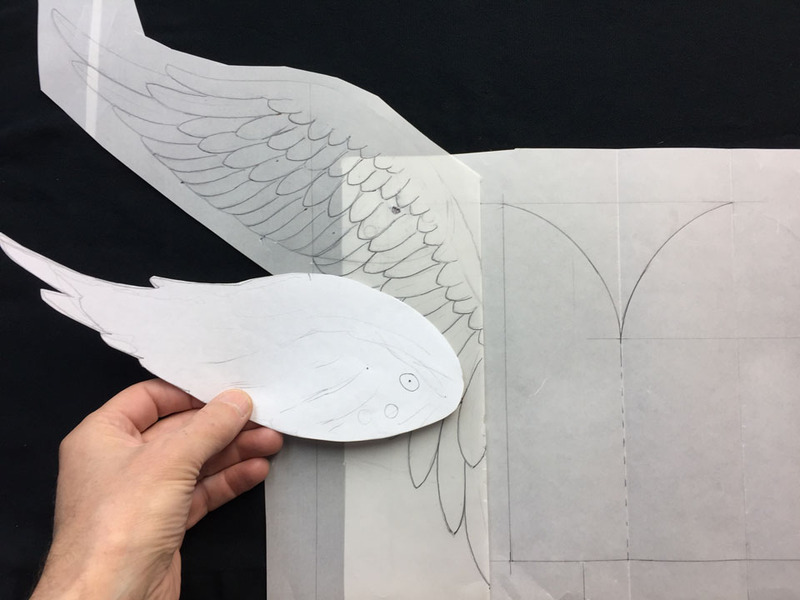 The wings took a trip back to the bandsaw to add some more indications of feathers. 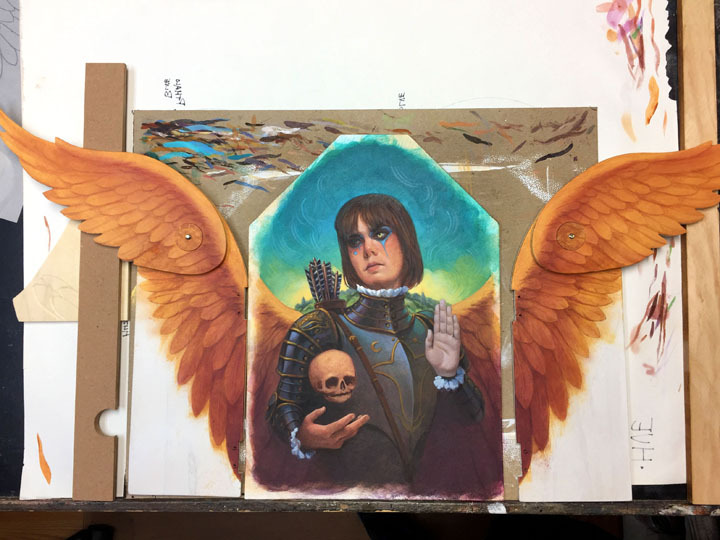 The wings/doors were placed alongside the central artwork as I painted to keep the continuity. I planned to carry the landscape background across the panels which would help make all three, or five depending how you look at it, panels read as one piece of art. However my initial idea of having the land rise up so that a portion showed behind the figure was not working so was painted out. You can just see the area planned for gold leaf application encircling the head. With the artwork complete I turned my attention to painting the casework. This is the old box of arrow paint replacements that I had tucked away. Still like new in the box, they needed to be given a nice patina. I love that green color, must be some copper under that shiny silver. Another trial fit of artwork and casework. Those holes at the top will contain the reliquary items, small pieces of bone, etc. created with polymer clay and encased in resin filled brass containers. I’ve also drilled holes for all of the arrow tips along the top and the two brass trim pieces at the bottom corners. 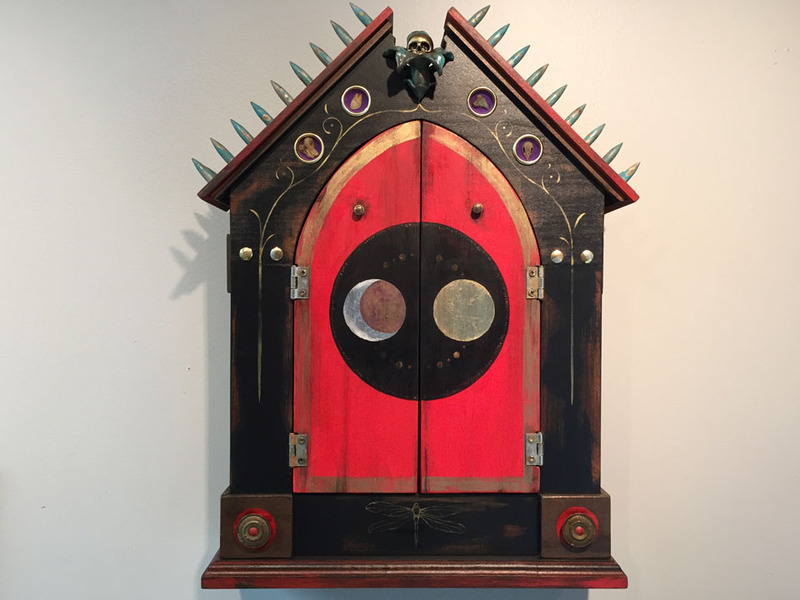 Once they are added I do some final painting, add the gold scroll accents, the dragonfly and then give the entire piece a coat of satin varnish. While the casework varnish dries I return to the painting to apply some antique varnish, a multi step process that produces the small cracks seen in the detail shot below. Then it’s on to sculpt the skullflower icon for the top and the reliquary items for the brass container inserts. The skull flower is composed of two different types of polymer clay around a central wire spine. When completed I fit it to the casework and drill into it from inside the frame. This way I can run a thin post that will anchor the ornament to the frame during final assembly. 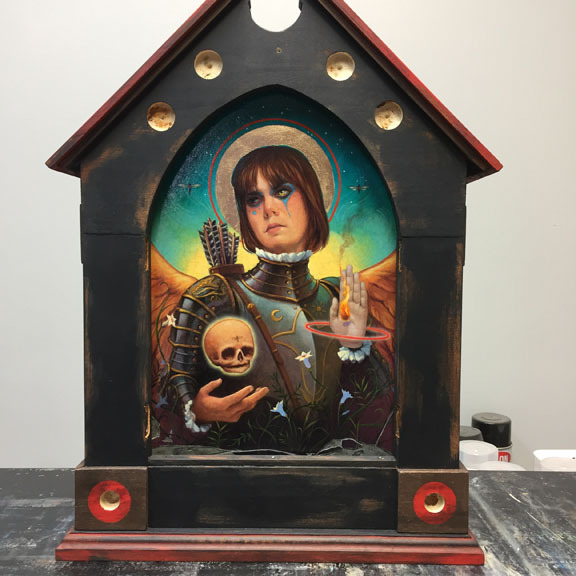 The reliquary parts are painted and after drying overnight, placed in the brass holders which are then filled with resin and left in an old cigar box to cure. When the painting is finalized I flip over the pieces and paint the doors. You can see how the wings hang inside the outer doors. All of the parts and frame have had sufficient time to dry before I do one last test fit of artwork and doors and then it’s on to the final assembly. 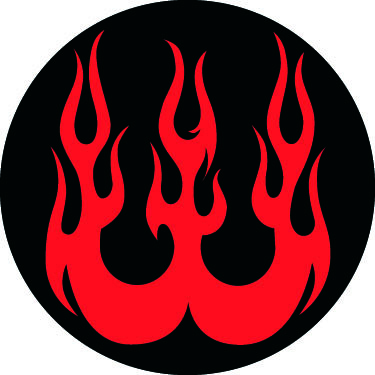 The moon and sun symbols are gold and silver composition leaf. I shot a quick in studio video which gives a much better idea of how the whole piece works and posted to my Instagram account. (And please consider following me if you are so inclined.) Watch the video HERE. “Bound” Approx. 8.5 x 5” dome size. Approx. 7 x 4 x 2” sculpture size. 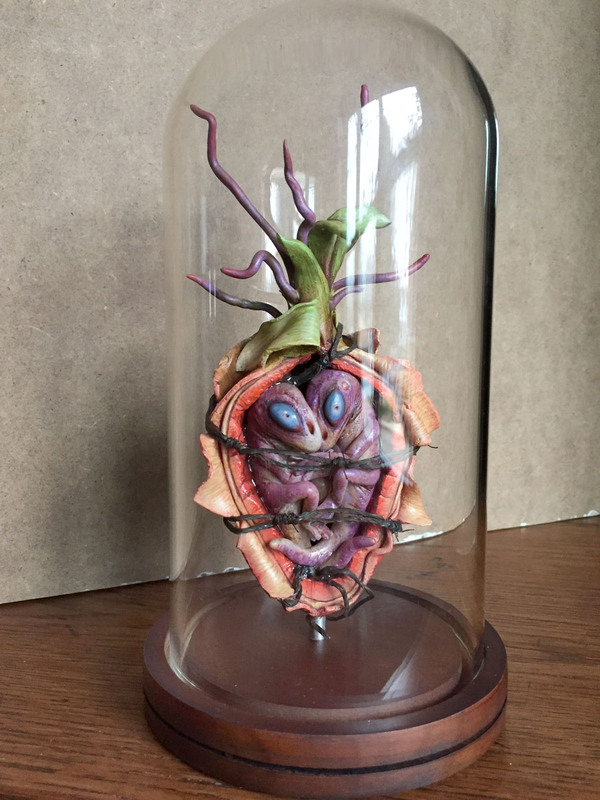 Apoxie and polymer clays, acrylic, resin, wire, metal rod, glass dome, wood base. 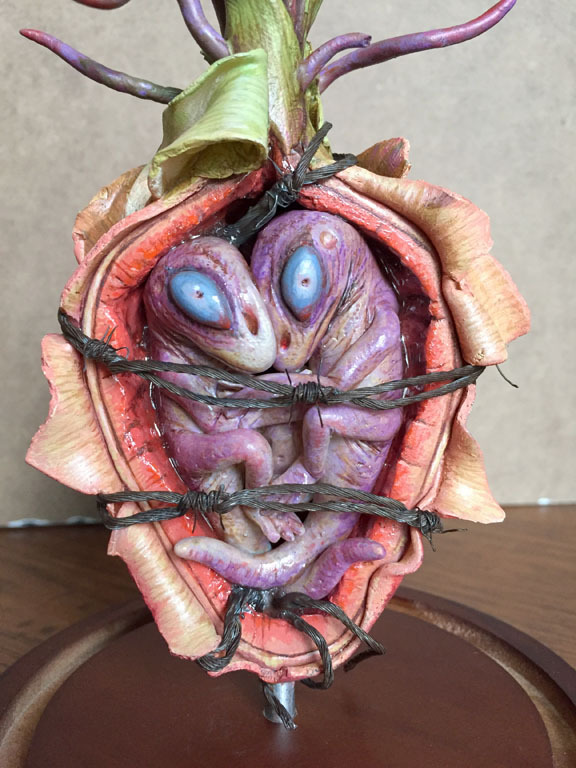 My newest sculpt comes from another little sketchbook entry, an idea that came to me one night while exploring more ideas of sculpting my embryonic figures inside of pieces of vegetables or fruit. I thought about the concept of two figures intertwined inside a core and their connection to each other. 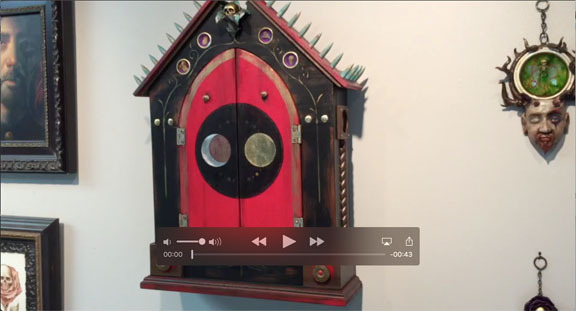 The final piece can be interpreted in different ways, I think, and I prefer to let each individual make their own decisions about meaning, so no more from me about that. But as always I love to hear interpretations from viewers so please feel free to contact me with any thoughts or comments. This is a crop of my little sketchbook drawing. About as far as I take these types of things. I like to get the idea down with just enough detail to record the concept and any important wrinkles then let the rest develop when I go to finish. 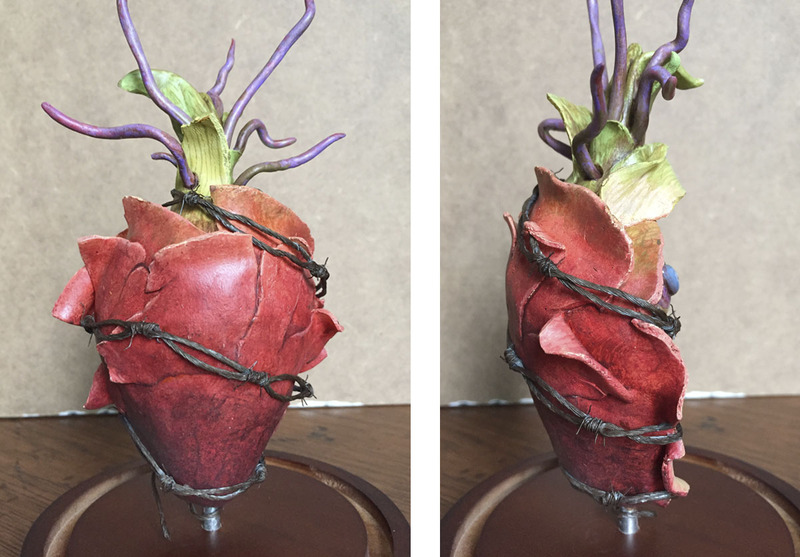 The pair of figures wrapped with barbed wire. I created the barbed wire, kind of a tricky thing to make especially at the proper scale, and took several tries to get right. Lots of detail in both the sculpt and the paint. The figures were sculpted separately and affixed in place. The barbed wire was added last. Back of the piece showing the heart shape and the way the skin begins to peel away. 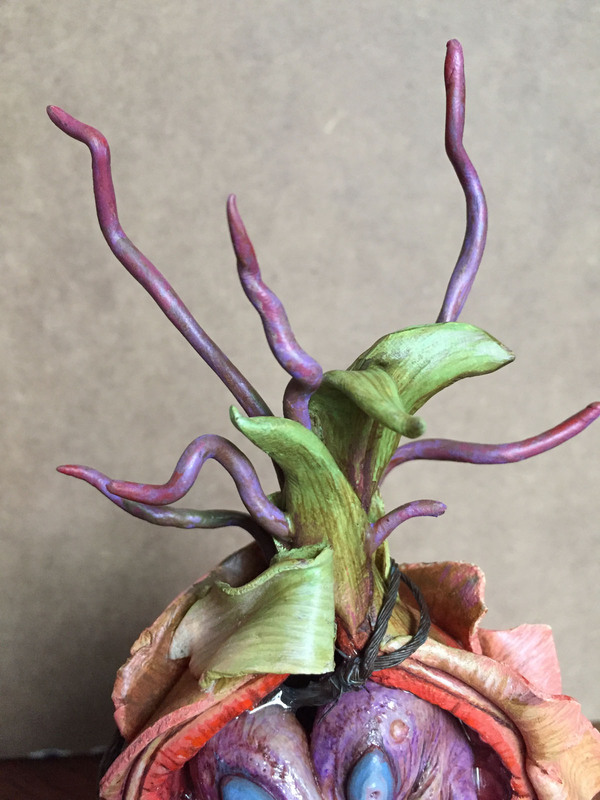 You can also see the purple shoots which have erupted through the top. 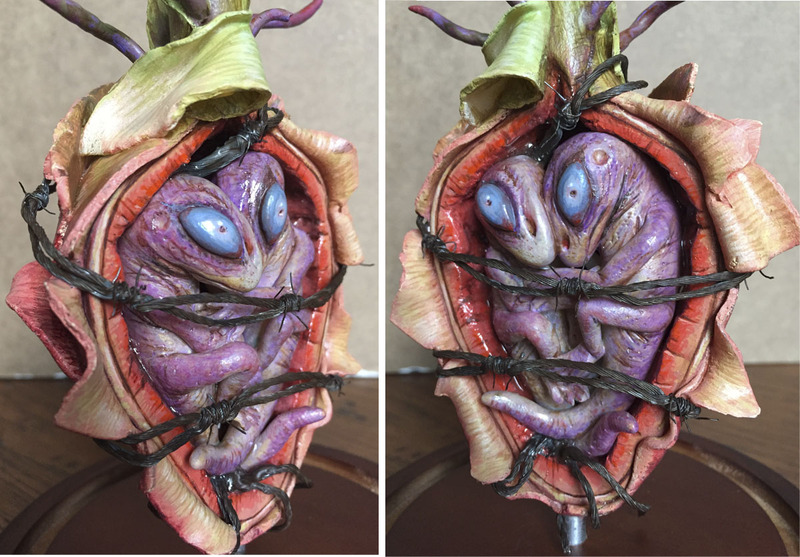 Top of the sculpt with the peeling skin, shoots and wire. Video of the finished work and an in progress video will be available on my Instagram account. And please consider following me on Instagram if you would like to see more of my in progress photos and videos along with up to date posts of current work. “Bound” is available for purchase studio direct. For more information and pricing please email me using the Contact page.